The world is home to some really crazy strangely put together buildings, some of them it’s unbelievable how they’re still standing or how they were even created in the first place. These buildings make excellent tourist attractions and continue to baffle visitors every day. Can I Visit These Buildings From Around The World? Most likely yes, places with unique buildings such as these embrace them and transform them into an attraction that creates revenue. However, individual buildings are ancient and would not be safe to visit inside so you may be restricted on a few of them, they’re still amazing to look at though. So what are some of the weirdest buildings around the world? Where are they and what is their history? Read this article for a full insight into the history of some of the world’s strangest buildings. The Little Crooked House based in Poland isn’t actually an ancient building and was constructed in the year 2004. The fairy tale themed building was created by two architects who took inspiration and ideas from the illustrator of a children’s book. This amazing optical illusion is built up of warped bent walls, curved stained glass and stone elevation, the roof of the building is concave and covered in green shingles that create the effect of dragon skin. This building is used as a tourist attraction and contains attractions such as bars, restaurants, shops, office space and even includes a polish version of Hollywood’s walk of fame. The creator of Habitat 67 named Moshe Safdie was the result of Habitat 67 and it was part of his architecture and urbanism program. 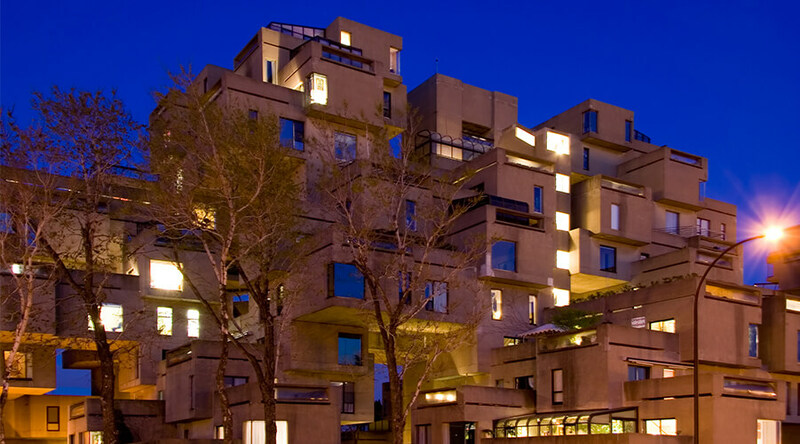 Habitat 67 then led him to designing some of the most renown buildings in the world, and after that, he would become a teacher at Americas Harvard University. Habitat 67 gets its name from the fact that this building was home to people who participated in the Expo ’67 and the whole buildings pavilion was for Expo ’67 afterwards, and from then on the name just stuck. Believe it or not, this lego looking habitat is home to a number of people, despite the fact you couldn’t actually imagine how the interior of these weird boxes would look homely. These buildings are made out of mostly concrete, and other recyclable materials, this entire group of block homes contain 354 cubes that are exactly the same and were arranged in odd different positions to create 146 residences. This unique shell shaped house was designed by architect Javier Senosiain in Mexico City, being one of the most unusual buildings in Mexico it is a typical tourist attraction. Nautilus House is an aquatic form of architecture that was created to combine marine with architecture, Javier calls a vast amount of his work “bio-architecture” that bases the idea of buildings based on natural principals of organic forms bring people back to local history, cultural roots and tradition to create harmony with nature. A family in central Mexico wanted to change their home into something more integrated with nature, and this Nautilus House is not only beautiful to look at, but you can also take in the beauty it really is, of modern architecture blended with contemporary art. The house features stained glass which flows flawlessly in tune with the buildings organic theme. This building was designed and constructed by archaeologist Erwin Wurm along with Museum Moderner Kunst to create an architectural attack in 2006. This artistic building was unveiled in October 2006 and features a modern day home which hits the back of the museum like a “bomb”. Erwin Wurm specialises in taking everyday deformations that he can edit to trick the mind and eye, the purpose of this strange building was to inspire archaeologists across the world, and Erwin Wurm was sure to be successful in that considering he is one of the most successful contemporary artists in the world. The house that is attacking the art museum represents our confusion of the perception of art and everyday reality, and the positioning of this house is to give the effect it has been thrown and landed directly into the museum. These strange block buildings were created by Pit Blom in the 1970’s when he was asked by Rotterdam Town to solve the trouble of people building homes on top of a pedestrian bridge, and after already building these houses in another town he decided to recreate them in Rotterdam. The blocks sit tilted on a pole and are made up of concrete floors, pillars and wooden framing. Inside the homes are divided into 3 levels via a staircase, the top holds the spare bedroom or spare living space, the middle level holds the sleeping and bathing area and the lowest floor is triangle shaped and is home to the central living space. The main inspiration for these odd homes are that they represent an abstract forest; apparently, the pointed tops of the homes represent a tree which when connected to it’s neighbour it becomes a sea of trees in a yellow human-made forest. The largest basket in the world holds a set of offices in Ohio USA, the seven-story basket was constructed in the 1970’s and is almost 200 times larger than it’s original model. It’s basket handles are heated to prevent ice formation on the top of the building, and despite this not being particularly energy-efficient all the wood for this building was harvested, dried, milled sawed and shaped in just one mill. Holding up to 500 employees the basket is centred around a 30,000 square foot atrium that provides an unreal amount of natural light, which ensures that during the day minimal electricity is needed which makes it a tremendous energy efficient building. Buildings based on natural light can be provided by our builders in Milton Keynes, and we have worked on homes that would like the maximum amount of natural light. So there are some of the weirdest buildings located in different places around the world, would you enjoy living in some of them or are they a bit to abstract for everyday life? At Clarkson Builders we ensure all of our clients are satisfied with our conversions in Milton Keynes and pride ourselves on the positive feedback we receive from our home extensions in Milton Keynes. No matter how abstract or difficult our builders in Milton Keynes are trained to make your dream home a reality.